Whether it's creating a brand you're proud to call your own, managing social media, implementing a strategy, or designing the website you've always dreamed of, your time is better spent working on what you do best. Let me take care of the marketing, so you can get back to business (literally). Unless you just found the cure for cancer, there's a good chance that hundreds of companies already do exactly what you do. How are you supposed to stand out? One word: BRANDING. Every business owner has the capacity to differentiate themselves and their business, but sometimes it takes someone else to see what sets you apart and how to turn that into a profitable strategy. Ahh, social media... the epitome of a modern day love/hate relationship. But it's not going away anytime soon! Whether you've never been on social media, have a few accounts but haven't posted in months, or post every day but with no clear strategy in mind, it's time to evaluate how we can nurture the most out of your online presence. We've all heard it, "word of mouth" is THE most effective way to make the sale. While that still holds true today, word of mouth looks a little bit different in the digital age. 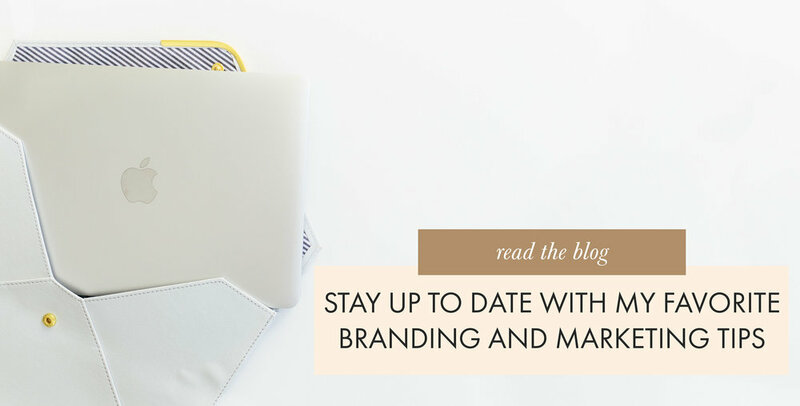 Let's get you in contact with the right bloggers and influencers who represent your voice, and whose followers are just waiting to be introduced to your brand! Digital home, sweet digital home! That's exactly what your website is. And just like your actual home, your website is a direct reflection of you and your brand. Everything on it should serve a clear purpose for reaching your ideal client. Let's work together to give your business a beautiful digital home, strategically filled with everything it needs and nothing it doesn't. the voice behind TOMASIK BRANDING, and I haven’t started a day without a large iced coffee in years. I spend most days in jeans or leggings, but still shop as if I have a party scheduled every weekend. I’m a proud 1st generation American of two Polish parents - and yes, that means I can grill a mean kielbasa with homemade sauerkraut that would put the store-bought stuff you’ve tried to shame. I’m the girl who always makes us sit outside if we go out to eat, and I’m happiest when it’s 85 degrees or hotter. Pinterest is my happy place and I dream of taking on a fixer upper one day (Jo Gaines, if you’re reading this please teach me your ways)! I’m a loving girlfriend to one handsome hunk of a history teacher, and pretty much left my 9-5 corporate job so I could get my life back, work from home, and spend summers with him… which leads me back to YOU. As a fellow small business owner, I’m guessing a large part of your decision to take the leap into entrepreneurship had to do with wanting to create a career that works around your life, not the other way around! My goal in working together is to remind you of this, and help take a load off your plate. I hope in inviting me into your life and business, you will experience larger profits, happier customers, and get more time back to spend with your loved ones.